Alex Gandel, #1 Agent with Troop Real Estate 2011-2014, Simi Valley, California, has listed an Updated 2-Story Pool Home with a Master Bedroom Balcony. 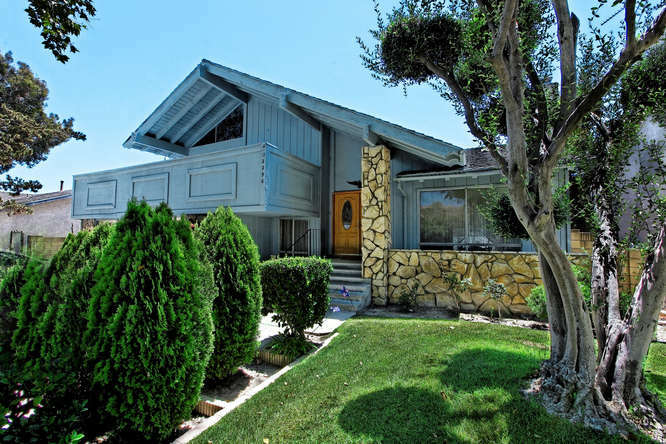 SIMI VALLEY, Calif. - Aug. 17, 2015 - PRLog -- Offered at $599,900, this wonderful central Simi Valley 5 bedroom, 3 bath pool home featuring gated RV access, a double door entry, a step-down living room with a vaulted ceiling and gas fireplace with a decorative wood mantle, a dining room with a chandelier and wainscoting, an enclosed spa patio room, an updated kitchen with granite counters, a travertine backsplash, under-cabinet lighting, a decorative trey ceiling, updated stainless appliances and a large granite island with a breakfast bar! Other features include laminate flooring, recessed lighting a laundry room with a sink, a downstairs bedroom and bathroom, a spacious family room with a slider to the backyard featuring a sparkling salt water pool with a diving board and slide, stone benches, tiered decking, concrete decking and a side RV area! The upper floor features three generous secondary bedrooms and an inviting master suite displaying a vaulted ceiling, a master balcony, dual pedestal sinks, a walk-in closet and so much more! Wow! Alex Gandel has been a full time Realtor for 35 years, 20 years of which have been with Troop Real Estate in Simi Valley. In those 20 years, since 1995, Alex has continuously earned the most prestigious awards for his production with Troop Real Estate. He attributes his success to his “glass half full” approach to his business and his life. His goal is to help as many people as he can possibly help to achieve their dreams and goals. In 2012 Alex’s son, Brad Gandel, joined forces with Alex, working as a fellow Realtor. Brad states he is “learning from the best!” Welles Miller, Alex’s Transaction Coordinator, has been with him since 2002 and is an insightful and informative catalyst who helps Alex expertly guide his clients through the sometimes challenging escrow and closing process. Cheryl Clayton works at Alex’s side as his Marketing Director and Buyer’s Agent and is a passionate centric force to the driving energy behind Alex’s proven and successful High Impact 360 Degree Marketing Plan. Both Welles and Cheryl are fully licensed, insured, experienced agents who have been actively working in Real Estate for over nineteen years. Alex calls this group “magical.” Together, with Alex’s keen insight and guidance, this magical team works with a mindset to continually “raise the bar” in service, communication, follow-through, creativity, perseverance and excellence. Alex Gandel and Staff are a combination of the best of both worlds: Working with the largest independent Real Estate Company in Ventura County, Troop Real Estate, as well as offering a “Boutique-Style” personal concierge service to their clients. Their clients never feel like another statistic or number. Alex Gandel and Staff are highly skilled, friendly, experienced and successful in working with standard real estate transactions as well as a variety of challenging circumstances, such as divorce, short sale hardship, contingent sellers with a home of choice, relocation clients and investors. By virtue of Alex’s longstanding professional reputation, he also receives many referrals from Realtors out of the area. The experience and camaraderie of Alex Gandel and Staff goes beyond the ordinary! They know how to get the job done for their clients! In addition to being a Top Producing Realtor, Alex is a devoted family man, married to his wife, Janet, for 26 years, and serves his community in a couple of different capacities such as volunteering on the Board of Directors of the Boys and Girls Club and the Board of Directors of the Simi Valley Hospital Foundation Board. Alex is also highly involved in the Troop Turkey-a-Thon every year serving as Founder and Chairman, feeding thousands of qualified people a Thanksgiving dinner throughout Ventura County each year. In 2014 Alex Gandel closed 101 transactions. His knowledge and “glass-half-full” mindset, as well as his incredible ability to “think out of the box,” enables him to continue to help a multitude of people throughout all of Ventura County from First Time Home Buyers and Sellers, to Estate Level Buyers and Sellers. Furthermore, Alex’s knowledge, experience, expertise and network spans over three decades which elevates his clients to an outstanding advantage of truly reaching their real estate goals.